The photo above is taken from the Peninsula-Castle Rock and looks southeast towards the Warner Mountains. 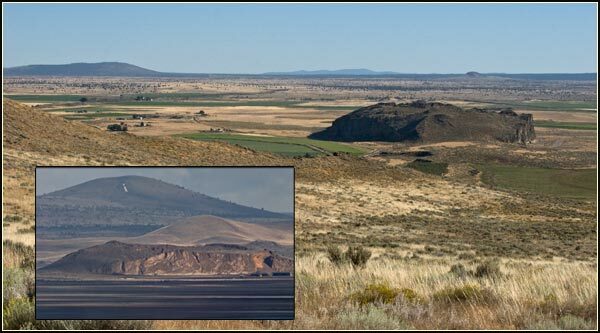 The inset photo is taken from Sheepy Ridge looking east across Tule lake Basin. Clear Lake Hills is in the background. this is open big sky country. This was, and still is, the old west. Welcome to Petroglyph Point, an archeological site, a sign-post of human endeavors. This vertical face is an ancient notebook and active habitat for a variety of birds. 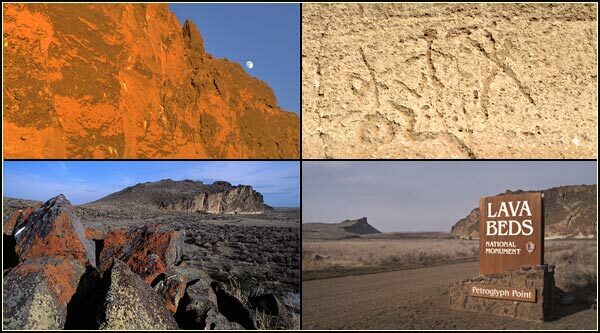 Petroglyph Point is an archaeological site located southeast of Tulelake, California. Petroglyph Point is easily accessible to the family car. The cliff with the carvings is next to a parking lot and bathroom. The wall is behind a chain link face. 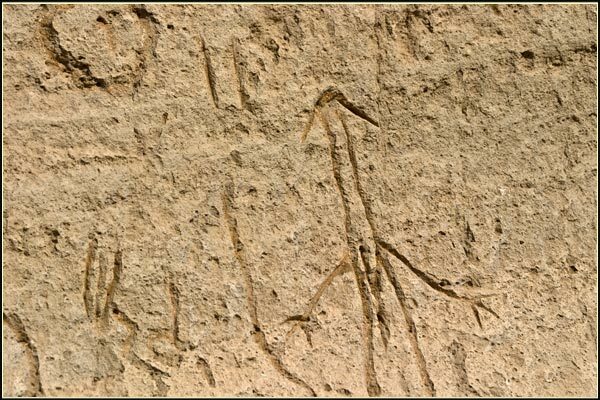 In days of old people came by canoe with sharp sticks or stones in hand to carve their marks into the soft volcanic tuff. That urge is human and continues today. The fence is an attempt to protect the old from the new. There can always be new but old is a different story. It is a family affair shared by flora and fauna. Humans have a fascination with places that makes them feel small. It is these places that cause us to pause and reflect on the world around us and the roles we play. Petroglyph Point combines scale and persistent marks of antiquity carved by those with bone, antler or stick tools for perhaps hundreds of generations. 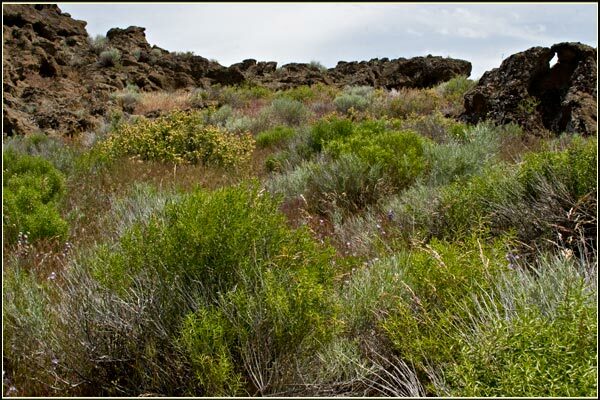 “As you walk along the base of the cliff, a trail brochure will guide you past petroglyphs and through stories of Petroglyph Point and the native peoples who have gone before and continue today. 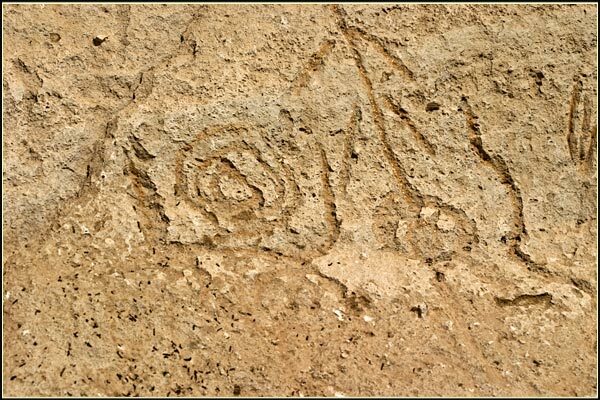 These marks are estimated to be 2000 and 6000 years old. 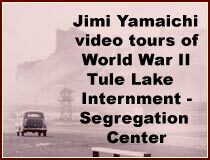 Tule Lake, that once surrounded Petroglyp Point, fluctuated greatly, year to year, so water, weather and man may have eroded or carved over existing marks. An unusual aspect of these remaining petroglyphs is that many are not of humans, hunting and animals – common to the western rock art. Many seem to be counting as if the cliff was a ledger. Others are geometric and astronomical designs that we do not know their meaning, or even, who carved them. 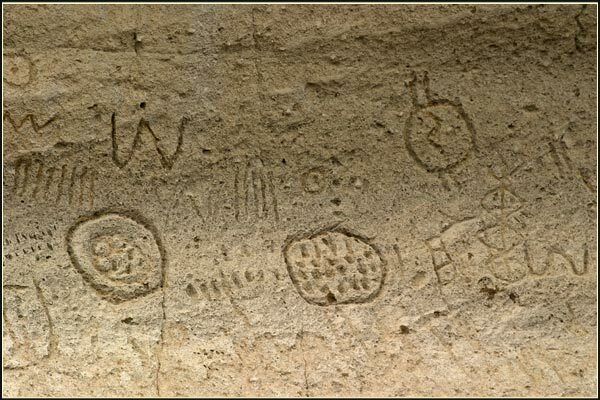 After the Modoc War most of the local Native Americans were moved to other areas as far away as Oklahoma and no Modoc people ethnographic study was conducted to record these petroglyphs’ meanings or intent. These are a couple of the more than 5,000 individual carvings. by Georgia Lee and William D. Hyder, University of California, Los Angeles and Santa Barbara. Modern times and people are always a threat of these petroglyphs. A trail less traveled is an opportunity to explore and discover. At the northern end of Petroglyph Point is a trail that takes the hiker to the top. This is an isolated place, an island in the sky. On my first visit I came across four deer foraging in the high spring grass. i paused, I let the moment wash over me, I continued on, renewed. Spring time and the flowers are blooming. A slight morning breeze under a timeless grey sky framed and gave motion to the colorful flowers. This is a harsh landscape, open to the relentless elements and isolated from its immediate surroundings. It is place I would go to if this was my homeland and I am sure in days of old many came to hunt and to watch the waves lap against this island, both physical and of the mind. 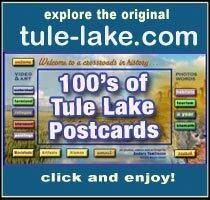 275,000 years ago cinders erupted through the shallow waters of Tule Lake. Layers of tuff accumulated from ash and steam explosion. 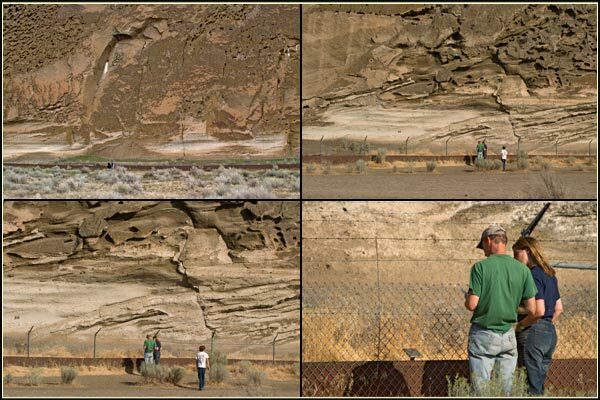 This is the nature that created Petroglyph Point. Basalt and andesite eruptions coated the slopes of the crater formed by subsidence. Behold a remnant land of fire and water. Petroglyph Point provides sanctuary for many birds. This is a place birders would enjoy. A short distance to the west there are shores of Tule Lake National Wildlife Refuge and Tulelake Irrigation District canals. 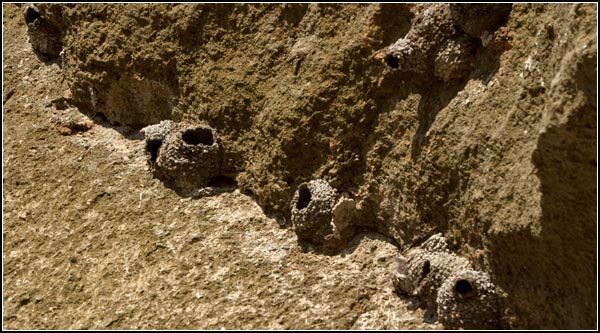 In the cliff faces, slopes and top of Petroglyph Point 14 different species of birds have been recorded to roost and breed in the spring and summer months. 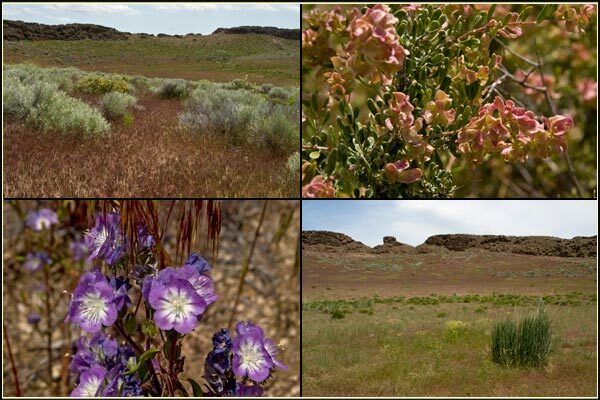 Here there is chance one may encounter Barn Owls, Great Horned Owl, Prairie Falcon, Red-tailed Hawk, American Kestrel, Cliff Swallow, White-throated Swift, Rock Pigeon, Common Raven, European Starlings, House Sparrows, Canada Goose, and Rock Wren. 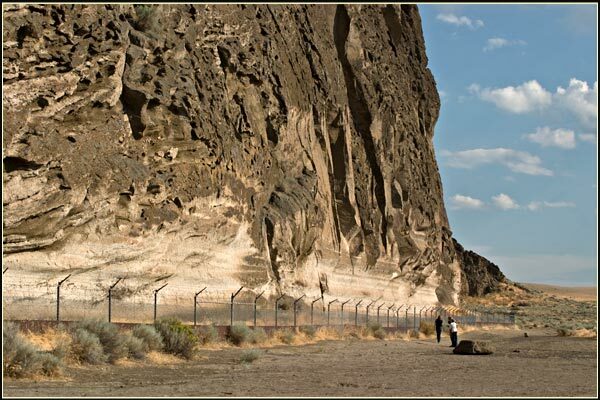 Petroglyph Point is 11 miles South South-east of Tulelake, California. It takes a special person to take the roads leading to Petroglyph Point. Not that these roads are difficult to traverse or hard to find – the carvings are but a stone’s throw as the crows flies from Highway 139. What it takes to be here is the willingness to slow down, breath, and allow the surroundings to do the talking. The Petroglyph Point Archeological Site was listed on the National Register of Historic Places in 1975. 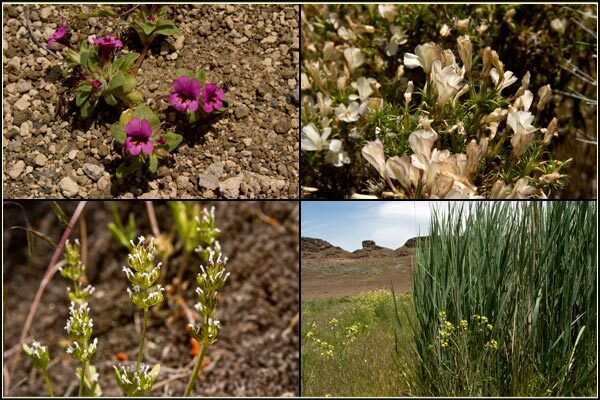 Quotes from the Lava Beds National Monument website are included.